표충사 대홍원전(大弘願殿) 앞에 세워진 3층석탑이다. 탑 앞에는 같은 시대에 만들어진 것으로 보이는 석등이 있으나 이 곳은 탑과 석등이 놓였던 원래의 위치가 아닌 듯하다. 표충사의 원래 이름은 죽림사(竹林寺)인데 신라 흥덕왕 4년(829)에 두번째로 크게 확장시켜 이름을 영정사(靈井寺)로 고쳤다고 전한다. 조선 헌종 5년(1839)에는 그때까지 밀양군 무안면에 있었던 표충사(表忠祠)를 영정사로 옮기면서 절 이름도 표충사(表忠寺)로 개칭하였고, 가람배치도 큰 이동이 있었던 것이니 이 탑도 그 때에 옮긴 것이 아닌가 추측된다. 기단(基壇)은 모서리와 가운데에 기둥 모양을 본떠 새겼으며, 각 면을 둘로 나누어 놓았다. 탑신부(塔身部)는 층마다 몸돌과 지붕돌이 각각 한 돌로 되어 있다. 1층 몸돌은 기단에 비해 지나치게 높은 형태로, 균형면에서 특이한 형태를 하고 있다. 표면 모서리에는 매우 넓은 기둥이 새겨져 있고 다른 장식은 없다. 2층 몸돌은 1층에 비하여 높이가 급격히 줄었으며 3층도 체감되어 있다. 또한 2·3층의 몸돌 모서리에도 기둥모양이 새겨져 있으나 너비는 전체가 축소됨에 따라 좁아졌다. 지붕돌은 밑에 4단의 받침이 있고 처마는 수평을 이루었으며, 지붕은 아름다운 곡선으로 흘러내리다가 네 귀퉁이에서 경쾌하게 치켜올려져 있다. 꼭대기에는 탑의 머리장식이 얹혀져 있으나 정돈되지는 못하고, 그 위에 1m 가량의 끝이 뾰족한 쇠막대를 세웠다. 탑신부 1층의 몸돌이 지나치게 커다란 단점이 있으나, 기단이 1단으로 구성된 신라석탑양식을 따른 아담한 탑이다. 탑의 머리장식도 비교적 잘 보존되어 있어서 주목을 받고 있는 작품이다. 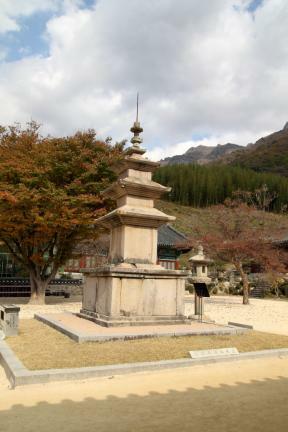 This three-story stone pagoda stands in front of Daehongwonjeon Hall at Pyochungsa Temple in Miryang City. In front of the pagoda is a stone lantern that seems to have been built at the same time as the pagoda, but it is presumed not to be the original location for both pagoda and lantern. 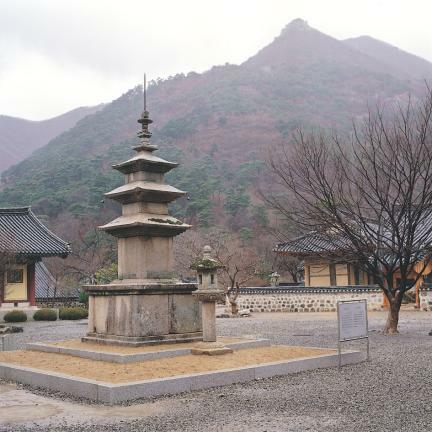 The original name of Pyochungsa Temple is said to be Jungnimsa Temple, which was expanded for the second time and renamed Yeongjeongsa Temple later in 829 (the 4th year of the reign of King Heungdeok of the Silla Dynasty). 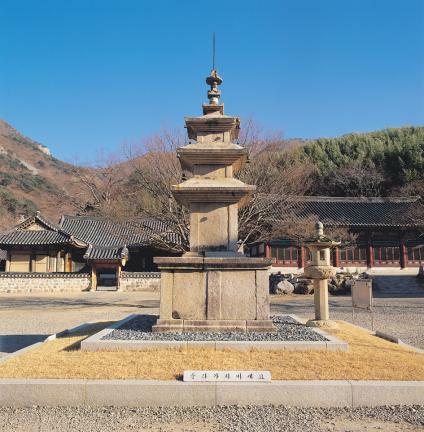 In 1839 (the 5th year of the reign of King Heonjong of the Joseon Dynasty) when Pyochungsa Temple, situated in Muan-myeon, Miryang-gun, was moved to Yeongjeongsa Temple, the name Yeongjeongsa Temple was changed to Pyochungsa Temple, and the arrangements of the buildings including this pagoda might have been changed at that time. The corners and middle of every facet -- divided into two surfaces -- of the stylobate are engraved with pillar patterns. The main body consists of roof stones and core stones hewn from a single stone each. In particular, the core stone of the first story is too tall compared with the stylobate and is unadorned except the corners, which are engraved with pillar patterns. The core stones for the second and third stories considerably taper in size compared to the core stone of the first story. Therefore, the pillars carved on the corners for the core stones of the second and third stories are smaller. The roof stones have four-tier cornices, and the eaves are horizontal. The roof stones curve beautifully and swiftly upward at the four edges. The finial is placed on the upper part of the pagoda somewhat carelessly, and a 1m-high sharp iron stick is erected on top of the pagoda. This pagoda also has some irregularity such as the single-storied platform and too big first story of the main; it is basically in the style of the Silla Pagodas. Surprisingly, the finial is relatively well-preserved. 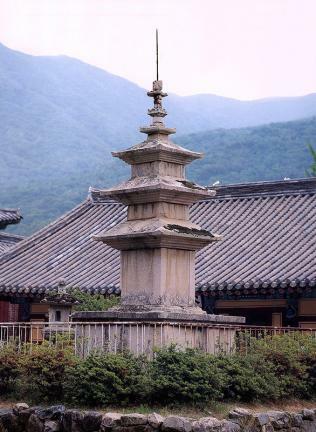 Although the pagoda has an excessively large core stone on the first story, it was built in the typical style of the Silla period’s stone pagodas composed of single-layer stylobates. 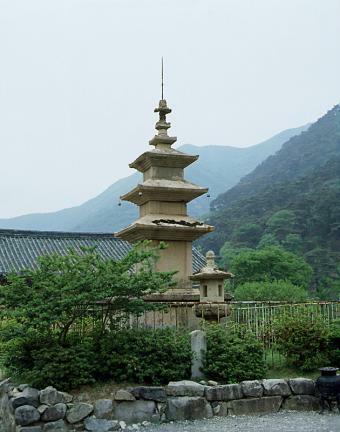 The finial of the pagoda is relatively well- preserved.